This research paper on the RICO Statute will discuss the statute in which an organized crime syndicate is being investigated. 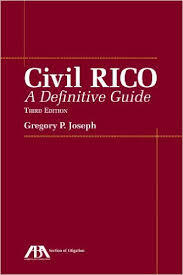 The criminal justice and law writers at Paper Masters will custom write research on the RICO Statute. Whether it is in relation to organized crime or just an examination of the law itself, our writers will help you out today. Anyone with an interest in crime drama may have heard officials discussing the RICO statute. It is often mentioned in procedural dramas in which an organized crime syndicate is being investigated. The reality is that there is a RICO statute in America, the Racketeer and Corrupt Organizations Act, federal law that provides for special penalties against a criminal organization, such as the Mafia, or a drug cartel. The RICO statute originated as part of the Organized Crime Control Act of 1970, originally intended to fight the Mafia. Under the RICO statute, any person who is believed engaged in any number of a host of federal crimes is subject to enhanced criminal penalties, including the forfeiture of property suspected of being acquired from criminal enterprise. In practice, the application of a RICO indictment often leads a suspect to plead guilty to lesser charges, in order to avoid the seizure of assets. In 1979, for example, the Oakland, California, chapter of the Hells Angels Motorcycle Club was indicted on RICO charges. Both the Gambino and Lucchese crime families were also prosecuted under various RICO statutes. In many jurisdictions, traditional RICO statutes are supplemented with the Continuing Criminal Enterprise Stature, the “Kingpin Statute” designed to prosecute drug trafficking. Goodfellas - Goodfellas research papers delve into a film about gangsters and criminal activity, and compares the evil of two characters. Gangster Films in Global Cinema - RICO Statute - This research paper on the RICO Statute will discuss the statute in which an organized crime syndicate is being investigated. ENRON – From Pipelines to Pipe Dreams research projects discuss the ethics Enron used in the company and what led to the Enron scandal. Soft Money - Political party soft money are funds raised by the national parties in amounts otherwise forbidden by FECA. HCA Hope Fund - HCA Hope Fund Research Papers delve into an example of an order placed on writing a case study on a specific non-profit organization. IMF - IMF research papers examine one of the leading international organizations designed to secure financial stability. Twentieth Century European History - Twentieth Century European History research discusses the economic, social and political devastation that had resulted as a consequence of the Second World War. War on Drugs - War on Drugs Research Papers go into the different programs created to help with this issue. Paper Masters writes custom research papers on the RICO Statute will discuss the statute in which an organized crime syndicate is being investigated.